Lunchtime visit. 4 beers on and a few drinkers in.£3.36 a pint in cheap bar. Dark Star - American Pale Ale 4.70 Nice beer. Dark Star - American Pale Ale 4.70 £3.36 a pint in the cheaper public bar. Best pint of APA ive had for a while. Even if it might be on blanket pressure?? Was in the area so decided to do a couple of new pubs for me, late afternoon visit not long after 5pm opening and fairly busy already. Despite pondering the many reports on here we decided to sit outside in the private garden area which is only accessible via the road and an anonymous gate, drinks being replenished via a serving hatch from the rear of the pub. Lunchtime visit. Funeral party in posh bar so decanted in public bar. JW Lees (see also Lees) - Founder's 4.50 Excellent Bitter. Early evening visit. ChrisE's visit report yesterday reminded me this house was on my bucket list. Tried both bars and they have a very much different feel. The meals being served in the saloon looked superb value, one piece of beef seemed to me to look like a small football! The 4p price difference between beers is quaint. The juiced up large Fremlins elephant on a high shelf and the 4 gleaming Tomson & Wotton brass wall plaques are items to covet. Early afternoon, the Saloon Bar had a number of people enjoying their home cooked food, whilst I used the Public Bar because it is 4p per pint cheaper in there. The barmaid told me that this is now one of just two pubs left with differential pricing but could not tell me where the other one is except that it is up North somewhere. I was very impressed with how highly polished the Tomson and Wotton brass trays were, they put mine to shame. Upham - Tipster 3.60 Not Tried This ran out. I dashed up here to get here before afternoon closing to find that the pub opens all day on Saturdays. I was looking at the décor wondering whether it was late sixties or early seventies, the landlady told me that it was done by Whitbread in the very early seventies soon after they had taken over Tomson & Wotton of Ramsgate. I decided to come here after reading Dosser's report that this pub still retains differential pricing between the saloon and public bars. 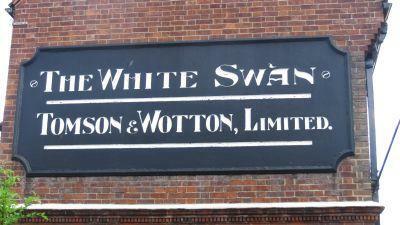 I had never been here before and was impressed by the Tomson & Wotton sign outside. I was told that this may have to come down as it is causing damp in the side wall, but am assured that it will go back once the necessary work has been done. The barmaid told me that there were some nice Tomson and Wotton trays in the saloon bar and moved my pint in to the other bar at no extra charge so that I could see them. 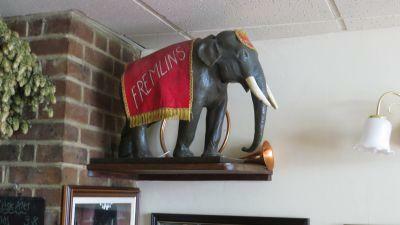 I was then introduced to the landlady who kindly switched the Fremlins nodding elephant on for me. She told me that she found this wonderful artefact in the cellar and the local fruit machine company restored it for her. I was also impressed with the nice clean and polished glassware, no nasty glasswasher residue in here. Definitely a pub that I will return to even though I was told later in the day that they use a cask breather, well I didn't notice. Burning Sky - Plateau 3.50 I had two of these, one for £3.16 in the public bar and one for £3.20 in the saloon. 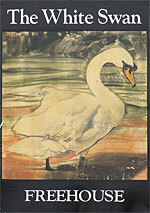 The pub is found in Reading Street, Kent, CT10 3AZ. 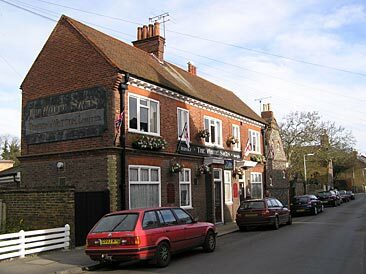 A street fronting pub, opposite the church, in an attractive village setting in the Reading Street district of Broadstairs. Still carries external signage from its Tomson & Wotton days. Still retains separate pricing for public and saloon bars. Very good value home cooked meals served primarily in the saloon bar. 2 handpumps in the public bar and 4 in the saloon. We have visited this pub 38 times, seen 95 different beers and tried 60 of them.